Space travel may be considered a relatively new human achievement, but the world's oldest writings say no. Space travel has always been possible, and people have been traveling the universe long before the invention of rockets and shuttles. Vedic evidence suggests that yogis and other more evolved beings can travel freely throughout the cosmos via technologies that are practically unknown to us today. 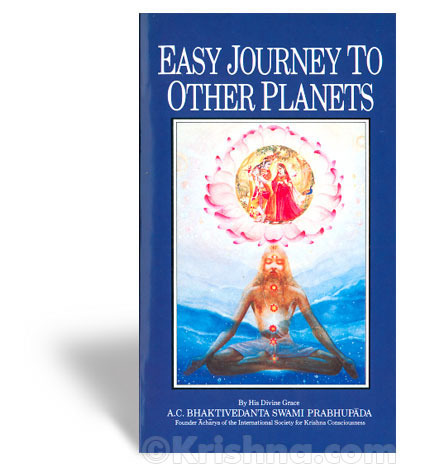 Srila Prabhupada wrote Easy Journey to Other Planets—with its frequent mention of "antimatter" and "antimaterial particles"—in 1960, in response to the "space race" going on at the time between the U.S. and U.S.S.R., and the obsession with exploration of the moon, etc. by means of rocket-powered spacecraft. Prabhupada questions the ultimate significance of such endeavors, while pointing out that the exploration of material space is neither a new idea nor the most intelligent one, from the spiritual point of view. In Easy Journey To Other Planets, Prabhupada shows through reason and reference to ancient Vedic texts that travel to other planets within this universe is ultimately an insignificant project. Our desire for cosmic exploration, he says, can be fully satisfied by traveling beyond this limited universe to the unlimited, antimaterial, spiritual world.